March began with generally mild temperatures. The Chinese Blue Flycatcher remained at Shek Kong throughout the period under review, but was only seen briefly and intermittently, its preferred area presumably being out of sight in inaccessible areas below the main catchment. The Siberian Crane, Nordmann’s Greenshank and Long-billed Dowitcher were all noted at Mai Po during the period under review and a Bull-headed Shrike and Radde’s, Goodson’s and Arctic Warblers were reported from Ho Man Tin by the local patch watcher. San Tin fish ponds had a number of good birds on the afternoon of 5th, including Greater Spotted Eagle, Japanese Sparrowhawk, six Oriental Pratincoles and two White Wagtails of the subspecies lugens. And to finish, another brief note on Barn Swallows. I wrote on February 18th that I expected to see Barn Swallows in my village any day soon. In fact, I didn’t see the first swallow in my village until March 1st, an unusually late date. I saw at least five swallows in villages at Kam Tin on the same day. Other local birders have verified that swallows have arrived rather later than usual – perhaps as a result of cold fronts passing through the territory in late February. There is also a feeling that there are fewer swallows in the villages than usual for this time of year. The weather during this period was generally cool, grey and humid with fresh easterly winds. Coincident with this poor weather was increasing evidence of bird passage. Mai Po continued to hold the usual suspects – Siberian Crane, Nordmann’s Greenshank and Long-billed Dowitcher - but the mud flats out in Deep Bay became much livelier than they had been for a while with an obvious influx of smaller shorebirds: Broad-billed Sandpipers, Great Knot, Curlew Sandpipers, Red-necked Stints, Greater and Lesser Sand Plovers were all in evidence. A Sanderling on 11th & 12th was a new early record by eight days. There was a turnover of the less common gulls: the adult summer Slaty-backed Gull remained until 12th, and an adult winter and 1st-winter were reported on 16th. An adult Pallas’s Gull was present on 14th & 16th and a Vega Gull on 16th. Five adult Pallas’s Gulls were seen in the late afternoon on 18th, a new high count. Two Nordmann’s Greenshank and four Far Eastern Curlews on 16th were again indicative of fresh movement. Other birds of note were single Pacific Swifts on 11th & 12th and a juvenile Pied Harrier on 12th. A Verditer Flycatcher and a Large Hawk Cuckoo were reported from Kowloon Park on 12th. An Emei Leaf Warbler Phylloscopus emei was singing at Pak Sha O, Sai Kung Country Park on 14th. This species was first recorded in Hong Kong from the same location (by the same observer, Geoff Carey) from November 22nd to December 12th 2015. There were two reports in 2016 – at Ng Tung Chai on October 9th and November 16th, and at Shuen Wan on December 6th. A Phylloscopus warbler heard and recorded at Ng Tung Chai in the second week of March by John Allcock was, after some research and discussion with Chinese-based birdwatcher Jonathan Martinez, provisionally identified as Claudia’s Leaf Warbler Phylloscopus claudiae. If accepted by the HKBWS Records Committee, the Claudia’s and Kloss’s Leaf Warblers will be first records for Hong Kong. Other reports of note were a Bull-headed Shrike, Chestnut-crowned Warbler and Verditer, Asian Brown and Grey-headed Canary Flycatchers at Chai Wan – all good records for Hong Kong Island - on 15th. Obvious spring migrants were a Blue-and-white Flycatcher on Cheung Chau on 16th; a Grey-faced Buzzard at Po Toi on 16th; 50+ Silver-backed Needletails at Shek Kong catchment on 16th with at least a hundred there on 18th. A Plain Flowerpecker was also present there on 16th and 18th. Two Ruddy-breasted Crakes were calling in Lam Tsuen Valley on 15th and a Slaty-legged Crake was heard in Tai Lam Country Park on the evening of 17th. The weather fluctuated during this period, with temperatures up to 29⁰ Celsius in the northern New Territories on 20th & 21st after a day of rain on 19th. Surges of the NE monsoon on 22nd and 25th brought overcast and cool conditions to the territory. There was a noticeable decrease in the number of wintering birds on the main reserve at Mai Po. However, the Siberian Crane remained on pond 16/17 throughout but was twice seen flying high over the reserve and calling. With fine weather forecast next week, it is doubtful whether this enigmatic bird will remain into April. In contrast to the main reserve, the Deep Bay mud flats were alive with birds, notably Curlew Sandpipers, and there was an obvious increase in the number of Caspian and Gull-billed Terns passing through. Up to three Pallas’s Gulls were present on 19th & 25th, and there were two Slaty-backed Gulls on 19th and four Black-tailed Gulls on 22nd. The Nordmann’s Greenshank remained faithful to the mud in front of the HKBWS hide on a 2-metre tide (see http://www.hkbws.org.hk/BBS/viewthread.php?tid=26214 for John Holmes’s photograph of this bird in flight). Interesting migrants on the main reserve were five Eurasian Bitterns on the evening of 21st and an Oriental Plover in non-breeding plumage on 22nd. Silver-backed Needletails continued to be observed at Shek Kong catchment (20 on 19th &23rd, 30 on 24th), and there were four Large Hawk Cuckoos and two Plaintive Cuckoos singing there on 20th, as well as four singing Rufous-tailed Robins. Other singing cuckoos of note were a Hodgson’s Hawk Cuckoo at Pak Sha O on 21st and a Chestnut-winged Cuckoo near Hok Tau on 23rd. Three Black-winged Cuckooshrikes were in Kowloon Park on 22nd. A Narcissus Flycatcher was at Nam Sang Wai on 23rd. On the same day, a Grey-faced Buzzard was seen on Po Toi. Po Toi came alive on 25th when migrants seen by Peter and Michelle Wong included two Swinhoe’s Minivets, Blue-and-white and Narcissus Flycatchers, Eyebrowed and Grey-backed Thrushes, Brown Shrike and Tristram’s and Black-faced Buntings. A male Siberian Thrush was at Shing Mun on 25th. 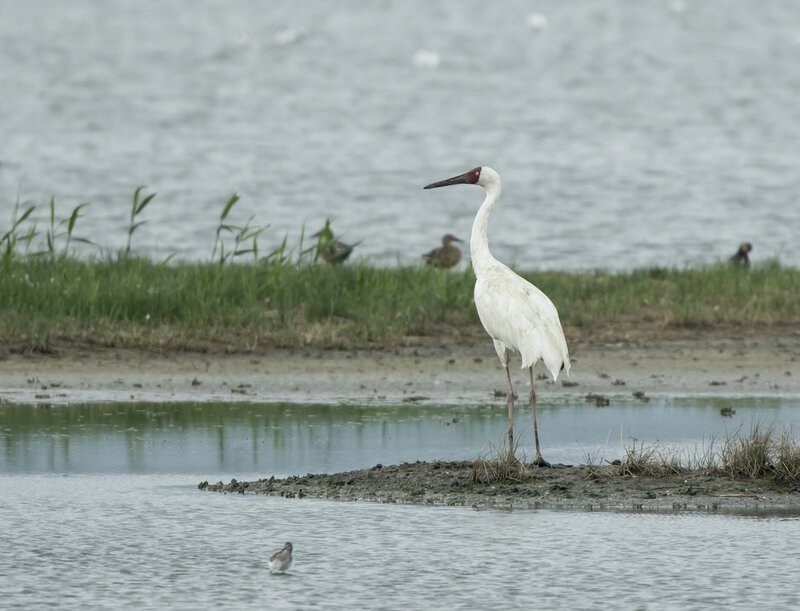 The Siberian Crane flew north out of Mai Po on the morning of 26th but was back in its usual feeding area on the scrape in the afternoon where it remained until the end of the month. Other sightings from Mai Po included a Pallas’s Gull and a good count of 143 Caspian Terns on 26th, a Nordmann’s Greenshank on 29th and a Slaty-backed Gull on 31st. Po Toi held Asian Brown, Blue-and-white and Ferruginous Flycatchers on 26th but all these flycatchers had moved out by 28th. However, many thrushes were reported on that date including White’s, Pale, Japanese and Grey-backed Thrushes, as well as Chinese Blackbird. for Guy Miller’s photographs of this bird), a Narcissus Flycatcher and an Eastern Crowned Warbler at Pak Sha O on 28th and a Grey-faced Buzzard at Sai Kung also on 28th.